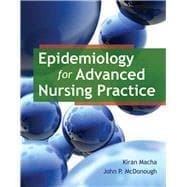 by Macha, Dr. Kiran; McDonough, Dr. John P.
Epidemiology for Advanced Nursing Practice guides graduate level nursing students to understand the basic concepts of epidemiology and gain and apply statistical conceptual skills. Focusing on the importance of disease prevention and community-centered migration, this text helps students expand their knowledge base while enhancing practical application skills and stimulating research interests. Designed to prepare advanced practice nursing students to meet the American Association of Colleges of Nursing (AACN) for Doctor of Nursing Practice standards, this text features expert insights, objectives, critical questions, and references.